We would like to announce the proposal of Casal Català de Victoria, to set up the foundation of the Castellers Crew, due to the great feelings we had the day of the “V” when we achieved the “pilar of 3″. The project will begin as a “school of castellers”, where anyone can learn the main concepts and the most important of castells. As long as we will acknowledge the technique, we will increase the level and difficulty. 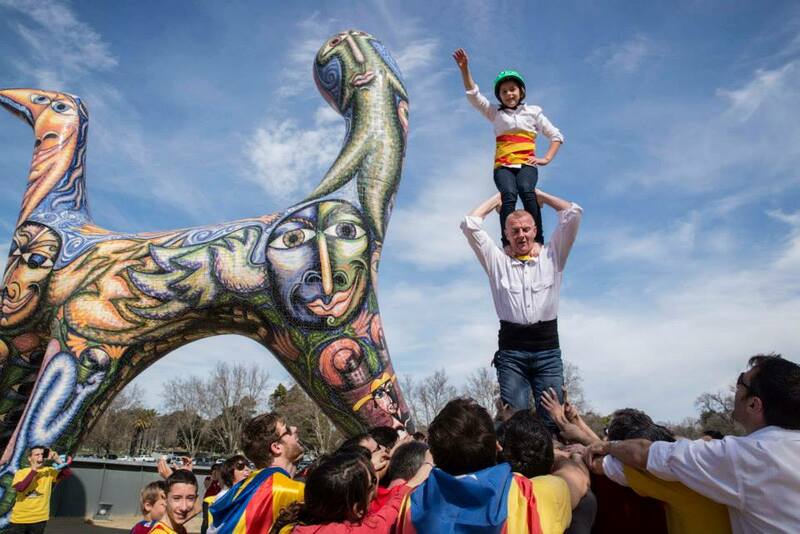 Old, youth, parents, grandparents, sons, aussies, catalans… human towers is an activity which anyone can take part of it. A “colla castellera” is not only made for the ones who climb, it is necessary castellers for the pinya, musicians, etc. Everybody is welcomed! We encourage those who collaborated or enjoyed with the “pilar of the V”, to continue being part of this new project. Your attitude is a great value! Promotion of the culture and the catalan language. It will be a good way to promote friendship between the members of the Casal, and also another way to practice and learn Catalan. We will be the first Human Tower Group in Oceana-Pacific. The main purpose will be to learn the technique to achieve, at least, one in every activity organized by the Casal. Every Colla Castellera, once is founded, needs help and experience of the more qualified ones. For this reason, the best colles act as a godfather of the new ones. We are in the process of finalising and agreement of collaboration with the Colla Castellera Capgrossos de Mataró, with which we will keel a relationship teacher-pupil, they will help us in technique issues, and also with promotion. During the next activity of the Casal, la Castanyada, in November 16th 2014, it will take place the official presentation of the Colla. The subcommittee is intensely working in the image and identity of the new Melburnian Colla. We are looking forward to show it to you! Also, it will be specified any aspect related to the rehearsal, and any other question about the Colla. 6. HOW COULD I BE AN OFFICIAL MEMBER? From this moment, we open the inscription process. We would like to have a huge number of great and enthusiastic people in 16th November to show the commitment of the initial members. You only need to send us an email to castellers@ccvictoria.cat with your name, age, email and phone number. 6. WHO LEADS THE NEW “COLLA”? In the last meeting of the committee, it was set up a new subcommittee composed by Jofre Bosch, Carla Cava and Jordi Poblet, who will organize and coordinate everything related to the Colla. This sub-committee is welcomed to new members, we would like to enhance its number in order to create more amb better ideas. We strongly believe that we can succeed in this amazing project through promotion of the culture, integration, friendship, and the most important, this Aussie Catalan project. We look forward to sharing more information about the Melburnian Colla. No Comments to "Become a “casteller”!"